Indian activist Mahatma Gandhi (1869-1948) was the leader of the Indian independence movement against British rule. Employing nonviolent civil disobedience, Gandhi led India to independence and inspired movements for civil rights and freedom across the world. Gandhi influenced important leaders and political movements. Martin Luther King and others, drew from the writings of Gandhi in the development of their own theories about nonviolence. King said "Christ gave us the goals and Mahatma Gandhi the tactics." Martin Luther King was deeply inspired by the nonviolant resistance that Gandhi practiced which has lead India to freedom. Gandhi was assassinated on 30 January 1948. King visited India in 1959 and met with family and friends of Gandhi. What King didn't know was that Gandhi was a racist. He fought to not have Indians treated the same as Africans and openly stated Indians were superior to Africans, going as far as demanding that Indians should have separate drinking fountains. So King standing next to Gandhi maybe should be reconsidered. 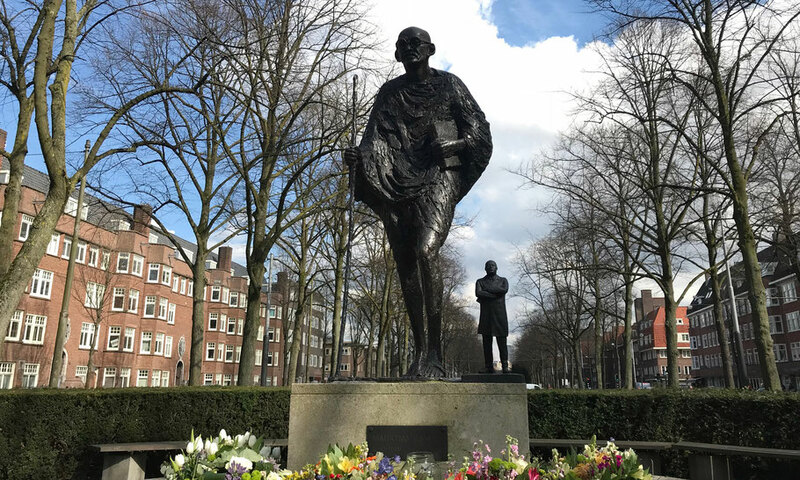 The Gandhi statue by Karel Gomes was placed in 1990 and is located at the Churchilllaan in Amsterdam.